If you wanted to get someone excited about going to a worship concert, your best bet would probably be to mention Hillsong United. The Aussie band, with its distinct flavor of rousing pop-rock and stadium anthems with epic builds, is arguably one of, if not the most popular worship band out there. If you’ve gone to a contemporary worship service anytime in the last 3 or 4 years, then chances are you’ve sung along to their songs. Across the Earth, with its obviously stylized title, is the first new offering since 2007’s All of the Above. That album signalled a break from the group’s past albums, not so much in style, but in that it was a studio album, as opposed to one recorded live. 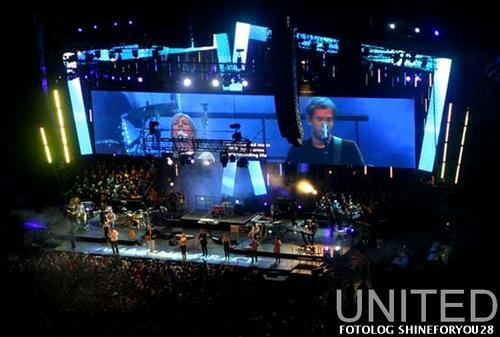 This new release sees Hillsong United returning to a live recording, replete with the “Do you love Jesus?! ?” shout-outs and thunderous clapping from the audience. This album, like its predecessors, follows the tried-and-true Hillsong formula. There is the anthemic opener, “Freedom is Here”, which starts and ends with a catchy synth line that weaves throughout the song. “More than Anything” and “No Reason to Hide” continue the momentum as both are solid, power-pop/punk tunes. The lyrics of the opening songs are celebratory. They aren’t particularly eloquent or poetic, even by Hillsong standards, as much as they are straightforward and obvious. The band switches gears and slows down the pace with “King of All Days”, “Desert Song”, and more tracks which continue the tradition of melodic ballads interjected with slow musical builds, but leave no lasting impression, aside from the fact that they are mildly enjoyable to listen to. One drawback of Hillsong is that afterwhile, you know what to expect musically from the band. Rousing pop-punk songs are followed by introspective, acoustic-driven ballads which either fade effortlessly into the next worship song, or provide a slow build that ends in a long, cathartic musical release. Of this middle section of the album, “Soon” provides the high point, with Brooke Fraser singing beautifully of her longing for Heaven. The song brings back United’s departed lead guitarist, Michael Guy Chisslett, who provides U2-like guitar stylings which elegantly frame the piano-driven ballad. The album ends with 2 crowd-pleasing hard-rock numbers which bring back the momentum. “Yours Forever” is probably the most distinct song on the album, which somehow seems right out of a 80’s hard rock/hair metal album. The singer gets the crowd going with the half-screamed chant of “Yours Foreveeeeer” and harmonized dual lead guitars reference bands which probably existed before even some of United’s own members were born. Across the Earth won’t disappoint the most dedicated of fans, but upon repeated listenings, it does not provide the highlights from previous albums such as From the Inside Out, The Time Has Come, Hossana, or Lead me to the Cross. What is clear is that with live recordings, songs can suffer. Compared to the mixing from the previous live albums, the drums and bass thud and boom heavily, while vocals and guitars in general aren’t distinctive, leaving a thick but sometimes unclear sound. On some songs, you can hear the crowd competing with the singers’ voices, and while it may be great to have such full audience participation, on “More than Anything”, the high-pitched shrieks that consistentlly ring out are more distracting than anything else. From a mixing point-of-view, Across the Earth does not have the clarity of sound that its predecessors had. As one who particularly favors United’s guitar work (which, like almost every other worship/CCM band out there, seem to draw huge inspiration from U2’s The Edge), the songs here don’t really showcase the beautiful ringing tones I was listening for. Part of it is the mixing of course, but it seems like since lead guitarist Chisslett left, the remaining guiarists are left with less inspiration and seem to be entranced with thicker, flatter tones. Across the Earth is a solid album which presents more of the United formula. It may be the best that CCM has to offer at least for this half of the year, but its counterpart, More than Love, to be released later this year, will hopefully rise to the high expectations that United has set for itself in its phenomenal run of the past 3 years.